Beat the cream cheese with 1 cups of sugar, and the vanilla extract in a bowl until smooth. Unroll the cans of crescent roll dough, and roll each piece into the shape of a 9x13 inch rectangles. Press one piece into the bottom of a 9x13 inch baking dish. Evenly spread the cream cheese mixture into the baking dish, and then cover with the remaining piece of crescent dough. Stir together butter, 3/4 cup of sugar, and cinnamon. Sprinkle the mixture over the top of the cheesecake. Bake in the preheated oven until the crescent dough has puffed and turned golden brown, about 45 minutes. 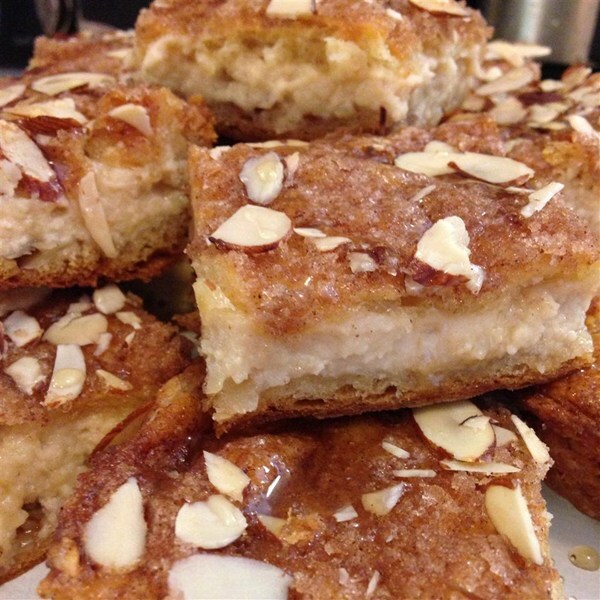 Drizzle honey over the top along with the almonds. Cool completely in the pan before cutting into 12 - 16 squares.